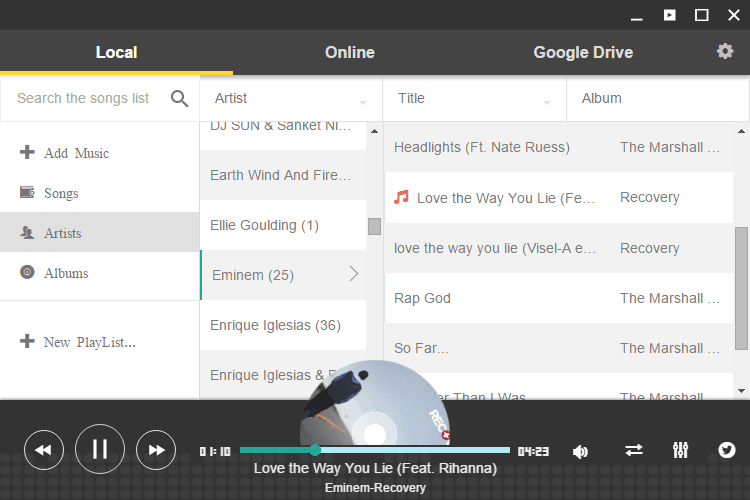 Enjoy Music Player combines local and online music on your Chromebook (and Chrome for Windows or Mac). Online music streaming services has taken over the world with storm. Almost all of you will be familiar with Spotify, Soundcloud, Gaana.com etc. But not all people have access to Hi-Speed Internet connection to stream music in good quality. There are many music player apps available to stream your local music files. If you're a Chrome users then you might want to try Enjoy Music Player. It is a music player app which combines local and online music on your Chromebook (and Chrome for Windows or Mac). You can use this app to play your music files stored in your local drive, or explore Trending Songs (needs Internet connection). Go to this link and install this app! Launch the app. "Local" tab will display music stored in your PC locally and "Online" tab will allow you to stream songs available in the directory. To play local music, you'll first need to select where music is stored so that the app can scan the directory and include it into playlist. To stream online music, move to "Online" tab and start streaming trending music. Try Search function to find your favorite songs. Google Drive tab lists the music files saved in Google Drive. You'll need to allow permission to this app to access your files stored in Drive. You can create your custom Playlists. There is a "Trending" section to explore popular songs. It has a Mini mode - See the icon near "Minimize" button. Try this app and see if you enjoy using it!